Your $18 donation will share the hope of Jesus with someone in need in Ethiopia by donating an Amharic Holy Bible. 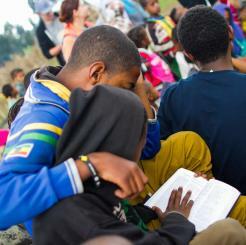 This Holy Bible is printed in their native, Amharic, language, and our teams, field director, and volunteers on the ground in Ethiopia often take time to pray with families in need. Nothing gives hope more than leaving them with God's word. $18 donation.